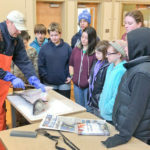 It’s one of the first questions I get when I tell middle school students that 90% of the seafood eaten in this country is imported. So I begin with the big picture, that much of that seafood is coming from countries that put a lot of chemicals in their seafood. Countries like China, Thailand, Chile and Ecuador don’t have the same health safety standards the U.S. does. I watch their facial expressions as I start talking about how and why antibiotics, hormones, bleach and other chemicals are used. In just a few minutes, it does matter. They care where their seafood comes from. 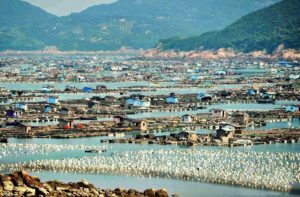 Massive floating community of fish farms in Luoyuan Bay, in south-eastern China’s Fujian province. Sometimes the middle school students ask why this happens. More often though, that question comes from high school students and adults. I then explain how the FDA is outgunned simply by the fact agents only inspect 1-2% of all seafood imports. Over the past few years, I’ve watched the FDA issue more and more alerts authorizing agents to outright halt various shrimp and other seafood shipments from China, Malaysia, India and other countries because of links to US-banned antibiotics. But the answer is really more complicated than that. Part of it has to do with U.S. consumption habits. We eat a lot of shrimp, but we don’t want to pay much for it. So the much cheaper product from Asia or South America floods supermarkets where consumers scoop it up without looking at the label or questioning the origin. 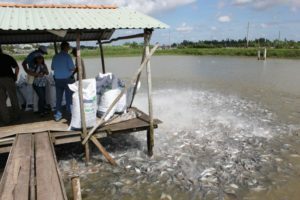 Fish farm in Viet Nam. 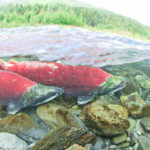 Part of the answer has to do with profit and the complex international seafood export industry. Bloomberg Business last month released an exhaustively researched, but well narrated story about this complex system. The report details how much of the seafood from China, which owns 60% of the $90 billion global aquaculture market, is shipped through other countries before arriving in the Western Hemisphere, thereby avoiding steep tariffs and close inspection (when it happens). This process is called transshipping, and it’s becoming widespread and difficult to track down, further masking true seafood origin. I recommend reading the story if you have 20 minutes or so. Here is the link. 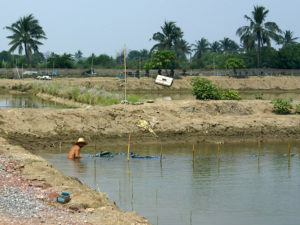 Asia has a centuries-old tradition of linking aquaculture and agriculture. Waste from pigs goes into ponds where tilapia and geese are raised. The tilapia gets much of their protein and nutrients from that waste. As diseases have increased in pigs, farmers have increased the use of antibiotics to fight the disease. The antibiotics pass to the fish and/or shrimp. Larger operations treat shrimp and fish with antibiotics to ward off disease. Increased antibiotic use has given rise to potentially lethal antibiotic-resistant superbugs, which are becoming more common. A recent study found that between 42% and 83% of Chinese carry bacteria that can destroy penicillin and most of its variants. A 2006 FDA study found a quarter of all Asian seafood tested had traces of chemicals banned in the U.S. This has led to a succession of FDA bans and alerts. The increased scrutiny has pushed some foreign seafood export operations into transshipping through countries like Malaysia that don’t have the high tariffs and increased inspection standards imposed by the FDA on China, for example. Tracking the origin of transshipped seafood can be difficult. The Bloomberg report cites examples of companies that have been accused by the FDA, and that have folded, with new export companies cropping up shortly thereafter. 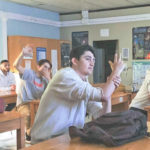 So what’s the lesson? Read labels. Ask questions. And if you can’t get seafood that is local or at least domestic to the U.S., consider other options. If you just absolutely have to have the farmed shrimp from Thailand because of the price, understand the implications … to your health and to the support of exporters more concerned with profit than customer health. 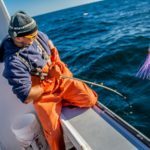 We can’t effect change in the domestic seafood web without at least first getting smarter about it. Top photo: Tiger prawn farm in Malaysia.